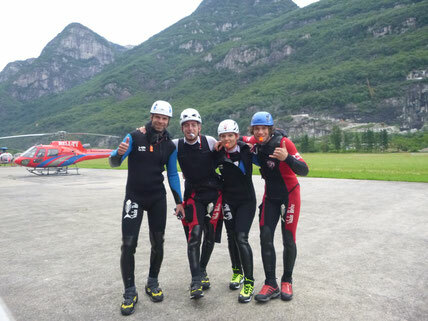 After a early bird start in the morning, we jump on the helicopter in Lodrino and after a 5 min. flight we reach the top of a tour called „Boggera“ – one of the best known tours in whole Europe. One cool jump is followed by the next one. Endless slides and the most spectaculare landscape you’ll find yourselfe in the middle of the best canyoning adventure ever! Because of the time needed to get there, we would recommend to you to think of a multi-day tour. This is not a beginner`s tour!